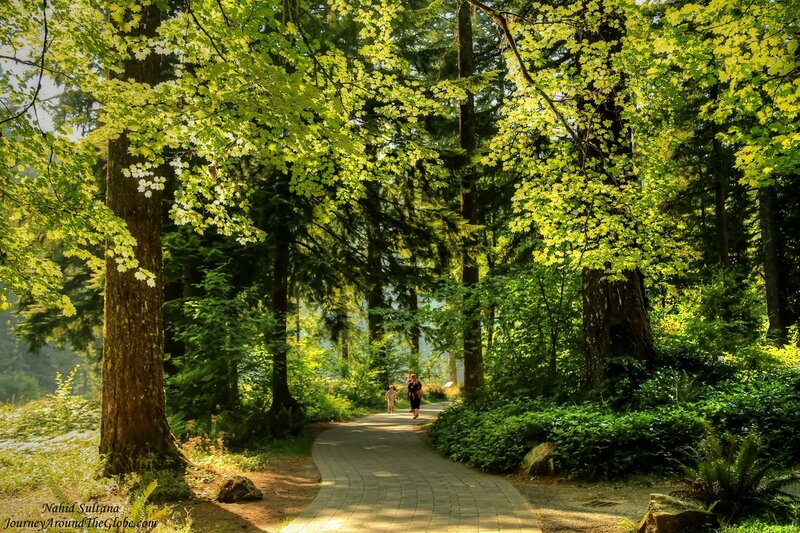 SILVER FALLS STATE PARK, OREGON: Famous for its breathtaking waterfalls, old buildings, and temperate rainforest, Silver Falls State Park is the largest of five beautiful State Parks in Oregon’s central Cascade region. I can’t promise you that you will be able to finish it in days or just weeks. It’s because you can do variety of outdoor adventures here as well as spend relaxed family time out in the nature. Play by the lake, spend a night under the stars, or just pack your lunch for a picnic in the forest. TIME of TRAVEL: First time we were there was with some friends in 2010 or 2011. We only walked around and behind the South Falls then. This time we were there for a community picnic. Although most of the time we were in the picnic ground, I managed to sneak out couple times to get a distant view of the falls and its trail. But didn’t really manage to go too close to it. If you are a photographer, I would highly recommend coming here during the fall season…should be beautiful looking at the bright colors surrounding the soft veil of the falls. EATING and SHOPPING: There aren’t much of shops in the park (of course) but I saw a café/restaurant very close to the South Falls. Best thing to do here is to bring your own food and a blanky and sit down on the soft grass or use a picnic bench for meal. PLACES WE’VE VISITED: For now, I am only adding South Falls of this park in my blog. There are at least ten falls you come across when you start walking on Trail of Ten Falls….a true paradise for the hikers or nature lovers or photographers. I will keep adding them every-time I visit a new falls. We were at a picnic there, so I couldn’t hike on this trail. 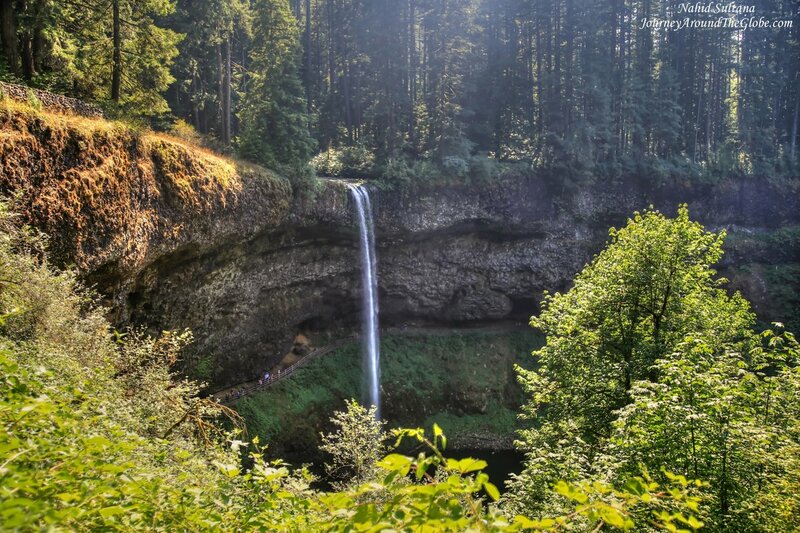 SOUTH FALLS: One of the most gorgeous falls of Silver Falls State Park is the South Falls. You can see the exposed rock in the waterfalls and creek bed with layers of rock laid down over the course of 26 millions years. Either you are looking from a distance or walking right behind the falls or just standing on the wooden bridge in front of it and looking high…this falls is breathtaking from every possible angle. I am not sure how long is the walk from top of the falls to all the down near the water and coming back to top again, but this is a bit steep hike in some areas. Some places are wet and muddy too. I even saw a thin and small snake on the upper portion of this trail. I am not saying these to scare you or anything…if my friend’s toddler boy can do it, then anybody can do it. Just use some cautions and wear comfortable shoes…it will be a sight to enjoy for all ages. What a beautiful and relaxing place with nature! Looks like a great place for a walk.